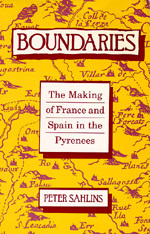 This book is an account of two dimension of state and nation building in France and Spain since the seventeenth century--the invention of a national boundary line and the making of Frenchmen and Spaniards. It is also a history of Catalan rural society in the Cerdanya, a valley in the eastern Pyrenees divided between Spain and France in 1659. This study shuttles between two levels, between the center and the periphery. It connects the "macroscopic" political and diplomatic history of France and Spain, from the Old Regime monarchies to the national territorial states of the later nineteenth century; and the "molecular" history--the historical ethnography--of Catalan village communities, rural nobles, and peasants in the borderland. On the frontier, these two histories come together, and they can be told as one. Peter Sahlins is Assistant Professor of History at the University of California, Berkeley.